Hi this is Alex from the Jeli Sound Archive in collaboration with Bristol Archive Records. In this interview I’m going to be talking to Simbarashe Tongogara, a reggae musician and independent music producer who has worked with a number of artists including Misty in Roots and Ken Booth. That’s very simple, he’s called Satchmo Louis Armstrong. Well I’d say later on I became very fanatical about guitarists. You name the big lead guitarists and they have been obsessions of mine. Jimmy [Hendrix] was one, him being left handed like myself. What were your early musical experiences, how did you realise you wanted to be a musician? Well, when I was in Jamaica as a young child surrounded by a very large family we grew up with my grandma. Her partner was a very hard working man. We didn’t have a television in those days so when he came home on a Friday evening we were his entertainment, we all had to perform something different. Well I tried to do as little as possible to get my share of the pie so I would always dance. I knew I wanted to do something in entertainment you know, and in dancing I felt I was writing different scripts every week because I couldn’t keep doing the same thing. I’d have to change little pieces and make it different. When was the first time you went on stage? I guess it's probably with Misty in Roots. We were all young budding musicians in England struggling because of not getting rights from the musician union and other things like that. We had to take the bull by the horns and set up People Unite musicians co-operative which was about not only just trained musicians but looking at things like the publishing of songs. It was doing everything for ourselves. I found myself at one stage being the road manager, the cook, the percussionist, all in the same band at the same time. Misty in Roots, that happened in London, when you got together with them? What made you move up from Bristol to London. You were living in Bristol? It's funny, up to this day I find that musical dilemmas are with Bristol, it's always left me very frustrated. I was never able to excel as I wanted to in Bristol. So, it made me have to go to the big city even though I’ve never liked the big city as a place to live in because I’ve always kept my roots in Bristol regardless. Did you know people up in London or were you already in contact with Misty in Roots at this point? No musicians just go where the music tells them to go. You just got your bag on your back and went up to London? Were Misty in Roots playing at this point? Misty in Roots were I guess like a lot of what the British reggae scene was like. People came from the Caribbean islands and they went to school here in England and had a passion for music. We went our own way. Where Misty in Roots were concerned, what really broke them was working along the university circuits and most people who have been to university within the 80s know of the band because they played at the university that they were at. It's kind of an amazing thing really because to this day I meet people in varied professions, that whenever I say Misty in Roots they’re automatically energized. You were their tour manager, you went on tour with them. Where did you go, what did you do? You did some European tours too didn’t you? Misty in roots were pioneers. We were the first reggae band to go to Poland just after the walls came crumbling down which was a really wonderful thing really. My name is Simbarashe Tongogara, it comes from Zimbabwe. Before it was independent we did a lot of charity work for Zimbabwe and when Zimbabwe was independent the government invited us to come there and we played at the Independence at a Stadium. When I landed in Zimbabwe to my surprise a lot of people knew about me and when they met me they said I am Tongogara, which means 'to stay' and that was what the people felt about me at the time, that I should stay in Zimbabwe. Later on, one of the tracks we talked about for Dan Ratchet was released in Zimbabwe for the drummer of Misty in Roots. He went to live in Zimbabwe and it's called The Time Has Come. That’s how young people were feeling in Zimbabwe just after the independence day. There were a lot of struggles and then there was this independence. They wanted to see a life, it was very difficult to see a life and the time had come. Changes must come. We’re still looking for these changes today in Zimbabwe. Obviously you did national tours in the UK on the university circuit. You also did European tours and when you say Zimbabwe, you did gigs in Africa, did you do any gigs in America or anywhere else? To be fair when it comes to Zimbabwe, Misty in Roots were the first reggae band to really tour Zimbabwe. Yes, Bob Marley did play for the first independence, but to actually tour the country extensively Misty in Roots were the first band to do that and today they have recognition in the country because of that. When you talk about America, because of some of the things that we went through and saw in the early days Misty in Roots always had a concept that we didn’t want to go to America. Yes after I left the band many many years later Misty in Roots did go and play in America but over all we did have a concept. It wasn’t really the money thing with us but a way of life so we did what he had to do and not necessarily whether we would actually get large volumes of money. Today some of the elements that make up how black music is in focus in England is through the pioneering groundwork that we did. Owning our own publishing company, doing our own P.A.s, we did a whole complete package. We had many bands on the label that were young musicians growing up. Misty in Roots changed many times over the years because we had to forever bring in new musicians to replace musicians that left and came in from the other bands that were on the label. For example the lead guitarist of Aswad ended up playing the lead guitar for Misty in Roots. So that just about tells you the whole geometry. You came into contact with Mark Stuart of The Pop Group in the 70s, tell me about meeting him. What did you do with On-U Sound? Did you do any work for them? First, as I said, I’ve known Adrian since 1976 so again it’s that thing where there's a link. The good vibes keep on flowing. In 1996 when Junior Delgado signed to Virgin and they sent him to us to record the first album, I met up with Adrian again which is how I met Skip MacDonald. Adrian had brought him over from America to work with On-U Sound. Me and Skip liked each so much that we formed a partnership that we know today as Small Storm. Tell me about your involvement in what happened after the 1980 St Paul’s riots and your recollection of the political climate at that time. I was born in Kingston Jamaica, I see myself as an African not even a Jamaican because actually I’m more British subject that I am Jamaican. Seeing that you have to tread the road in life and within that journey I said to myself to also be a Bristolian because I’ve lived more of my life in Bristol than anywhere else. The riots in 1980 in Bristol, it was like yes I am a Bristolian, it was happening right on my doorstep, not the next street or the next neighbourhood but right where I lived. It was something that was for me, and I hope for a lot of other west Indians at the time, a deep distress. To find that the mother land who we thought so much about didn’t care about us but also wasn’t prepared to give us a lifeline. It was sad yes, but as with most things it only happens for a time, sooner or later it must come to an end. So, I was made the ringleader, within that I did a lot of what could be called activist activity. I would look up the things I thought deeply distressing, legally in terms of defending yourself and in terms of when you have to deal with the law. The people in 1980 were charged with riot, which not many people knew could have meant a life sentence. If the death penalty was available you could also be hanged, it was a very serious charge and it was something we had to look at. Myself personally, with young children I didn’t want them growing up in a society where they felt they had rights but were scared to defend them in case they went to jail for a long time. You can see how dear it was to my heart, so I didn’t see myself as a ringleader or anything like that, I saw myself as somebody who had to stand up and be counted. A lot of people they wanted to stand up but couldn't, afraid of reprisals. I’ve never been in fear of that. 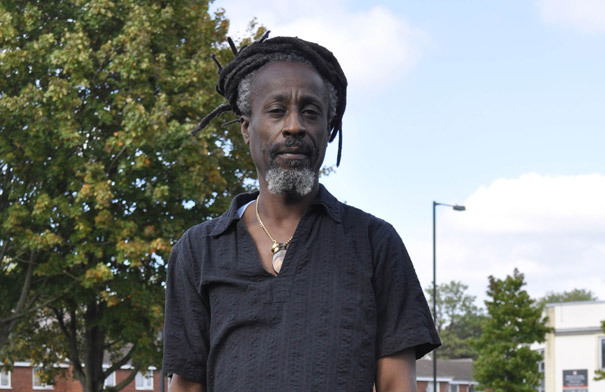 I saw myself as a musician and after the riots I went back to being a musician with Misty in Roots so on it didn’t affect me as it would have affected a lot of people in the community who did ordinary jobs like being a bus driver or a mechanic. My first profession in Bristol was being a British airspace corporation employee working on the concord. Those were the values that you had to adhere to. Tell me about the lawyer you got involved, or tell me a bit about the case. It wasn’t that I got a lawyer involved. The team of people involved who were passionate about making sure it wasn’t only a Bristol issue, it was a UK issue. Black people were looking to the mother country but it rejected us and here we were finding a way to be heard and to be seen. We didn't mean it to be confrontational. If you asked people at the time they wanted to be heard and to be part of the society. The lawyers that did get on board were people like Rudy Narayan, Paul Boateng, Gareth Peirce who became a renowned lawyer throughout Europe. Paul Boateng, what did he do? Paul Boateng was my lawyer long before the riots because he was the lawyer of Misty in Roots and he helped us form our music company. So we’ve had long associations with Paul, up to this day I have associations with Paul. He changed my name by deed poll by the way. So tell me about the work you’ve done as an independent music producer. In particular the stuff you’ve done taking bands over to Jamaica from Bristol. You did Talisman's Jam Rock album or was involved with it, didn't you? I mentioned earlier I that I have found my musical experiences with Bristol as kind of sad and sore but I’ve always tried to work within the local community that I live in. Work among people I’ve grown up with, trying to make something of themselves within the business. Yes, I’ve worked with Buggs Durrant, Joshua Moses, Talisman, with my cousin Dan ratchet, Hutchy [Horace Hutchinson] or Predator as he’s known and quite a few of the other local people. As for being successful with them I’ve always found that the challenge has eluded me. You must have people that you're still regularly in contact with in Jamaica, where is the tie, did you still have relatives out there? What was the major thing that kept you going back out there? I said also that I see myself more as a British subject more than a Jamaican. I guess for me the thing that keeps me tied to Jamaica, the place, is the music. I find that if you really want to concentrate on what you’re doing in reggae music, or some elements of the music, Jamaica is a really nice placer to vibe in. It might not have the outlets or the some of the real aspiration that Europe has in terms of the finances and so on, but yes it has that explosion. I’ve always liked recording in Jamaica and I’ve recorded in some of the best studios and the worst studios but I’ve recorded across the island. Listened to different sounds, that’s important in the music. Sound travels and that's what you want to use. Different studios have different sounds and different tracks require different sounds. Who are some of the other people you have worked with? You’ve mentioned Dan Ratchet and Joshua Moses, Predator and Talisman. Are there are any other people you've worked with? As I said I like the instrument element of the music being a writer. I've always over the years fused different sets and calibres of musicians together. We talked about On-U and Adrian, he does a lot of similar things to what I do. 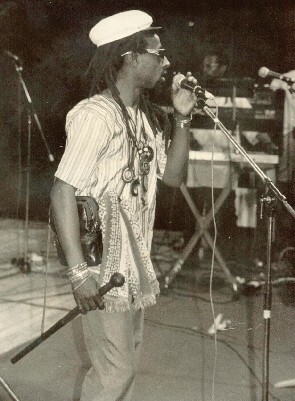 For instance one of the tracks released on Bristol Archive Records was done by the drummer Style Scott from Roots Radics, Gregory Issacs' band and the bassist he was Aswad's bassist. So you can see the type of fusions there, the keyboard player was from Black Uhuru, the lead guitarist was Earl Chinna Smith from High Times. So a lot of across the board collaboration. You’ve subsequently worked in the community on a number of projects including St Pauls Youth Promotion, Bristol Multicultural Development Cooperative, and St Paul unlimited. Am I missing out any, have you done more than that? I think a lot more, but really during 2000 I knew that a major development was going to happen in Bristol in Broadmead. That St Pauls, Easton, Lawrence Hill, St Judes, all the areas that were affiliated by black people were backed onto this project but yet there was no way for them to procure for contracts. I don't mean for an individual getting work, but to procure for the contracts that maybe 500 people or whatever could get work. 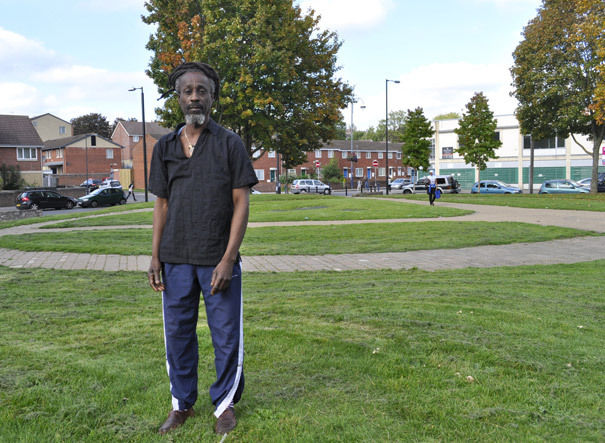 I found myself again campaigning and so I helped set up the Bristol Multicultural Cooperative. In terms of looking and getting work on the project. Yes, but within that St Pauls Youth Promotion was really what helped the Bristol Multi-cultural Cooperation to come along because I had set up St Pauls Youth Promotion before. I did so because a lot of youths were suffering the impact in St Pauls from the drug scene or the drug trade that was happening in St Pauls. Lets be clear St Pauls never had a drug problem. It has a drug sale problem but not a drugs use problem and the young people from St Paul’s were suffering from the effects: needles, all types of different things that you could name that could happen from the trade. I felt that I wanted to highlight their plight and show that they were prisoners in their own community. So I helped formed St Pauls Youth Promotion. In doing so some of the young people have taken it to a new level because they have set up something that's called Culture Club and Culture Clash which has really taken it forward. Perhaps you have just answered my question but how do you get involved in these projects? For a number of years I’ve been seen as the black activist, even my name Simbarashe means the power of the lord. Maybe that has something to do with it. Let's get that right, it's not more recently I’ve worked with Ken Boothe, Ive been working with Ken for a number of years. I’ve been working with Ken since 1987. In 1987 I did a tour of the UK with Ken. We’ve been working alongside each other for a number of years but for many years now I have been writing some of what I call my premium material. I wanted it not to be showcased as poppy material, it is mostly rhythm and blues. I chose Ken Boothe to do the vocal on that particular album, so for the last 5 years we’ve been working on this rhythm and blues album. It's almost finished, its almost finished! Some of the tracks have been released, or a single has been released on Peter Gabriel’s label. I cant remember what his label is called. One of the tracks was released on his label 18 months ago by Skip McDonald because Skip was signed to Peter Gabriel’s label. Who is your partner in Small Storm recordings? As I said in 1996 when we signed Junior Delgado to Virgin records, Virgin sent us to On-U to record our first album. I met Adrian Sherwood who I had known since 1976, so good vibes, good vibes. Skip was Adrian's partner who he’d brought over from America to work with him on a number of projects. Me and Skip we really liked each other and over the years we developed ourselves into a partnership that we now call Small Storm. The Ken Boothe album, me and Skip are the producers on that and all the stuff is written and produced by us. Are there any other things in the pipeline you’ve been working on for Small Storm or is it mainly the Ken Boothe stuff? The Ken Boothe stuff is an album containing a lot of premier writing that I didn't want to go into a poppy collection but I've got a lot of stuff from different artists both Jamaican and UK. For instance I am also the producer of Kens’ younger son, Ken Junior, and we have tracks for him as well. We’re hoping to get together a combination album of some of the other artists. There’s a lot of stuff in the pipeline. The music business is a family, when you join the family you find that your family becomes extended and extended, over and over across the globe. In 1996 me and Skip became partners but skip also came from an extended family from America and a few of his extended family played for the Rolling Stones. In one of these sessions in the UK a visit was made to where me and Skip do all our recordings and Ronny came and he liked the vibes and we liked the vibes of him. On a few occasions we’ve done various little jam sessions. It's an extended family of musicians. Do you have any humorous anecdotes involving any of these notable people? Do you remember any funny incidents? Well for me the only thing I'll always remember and say is a funny incident is going to Zimbabwe to play a concert only to find out that we were trapped in the stadium. Other things were going on in the country and that affected the music. It’s so sad that you just can't change these things. It seems to be happening today in every walk of life whether it's sport or whatever. You find that you really can't do what you like without first looking at situations on the ground. It doesn’t matter where you are but you need to look and see what's happening locally on the ground before you can decide what you really want to do. What was going on outside, was it some violence? A local election was coming up, just like we have local elections here in Bristol. It coincided with the concert. The police had fired some tear gas at hundreds of people that were outside the stadium who were protesting but the wind blew the tear gas in the stadium and 18,000 people panicked and rushed out of the stadium, half drunk and crazed, not knowing what was happening. They blockaded the stadium and we were trapped in the stadium. They just started stoning the stadium to pieces, it was a horrendous sight but I’ve lived and I'm here telling the tale. Cool. OK thank you very much Simbarashe for taking part in this interview.